Every sport has the young star who knows he’s both young, and a star. The NFL saw it with Odell Beckham Jr., who exploded his existent popularity with a catch that seems to have reverberated throughout all time. The MLB saw it with Bryce Harper and his aggressive, “I’m-the-next-best” personality that put him in the spotlight he continues to live under. There are numerous examples of players like this throughout all sports, but for the Association of Tennis Professionals, that player is Nick Kyrgios, a 22-year-old Australian with a mercurial temperament and preternatural ability on the tennis court, a physical and emotional pairing that seems almost inextricable in the bodies and minds of young phenomes. But Kyrgios hasn’t exactly reached super-stardom yet. He is ranked 19th in the world, but really possesses top-10, maybe top-five talent. As is custom with players of massive talent, there is also emotional volatility and conceitedness that comes with international recognition at such a young age. Couple that with the realization that comes when any keen tennis eye sees Kyrgios play and makes the off-hand comment about potential future greatness, and you have the precarious psychological makeup on not only a fine-tuned athlete, but an expectant celebrity. That all said, to watch Kyrgios play tennis is as if you were watching a grimy pearl, freshly brought up from fifty fathoms, play tennis. There is the beauty of the unprimed in Kyrgios’ tennis, a sort of sublime duality of seeing two layers at once. 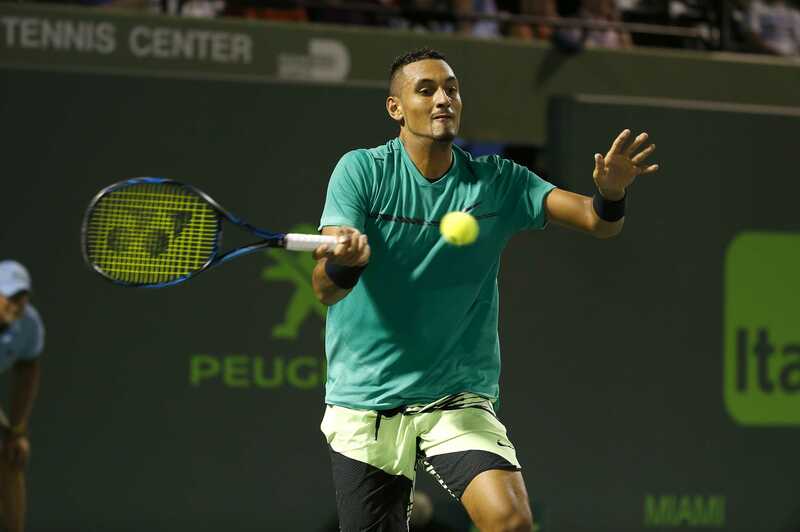 Standing at 6’4, Kyrgios has a slimly broad musculature in the ballpark of, say, the skater version of Dez Bryant, and walks with bounce and a hunch, portraying an almost huckster-ish persona, as if to surprise you with every devious pounce. It’s swagger, but of the underestimatable kind that scares, shocks,and uncomfortably jolts you when it manifests its legitimate ability. The majesty of someone like Kyrgios is that in a sport sometimes characterized by stilted etiquette and Victorian repression, he can, via his demeanor and play, act as an anti-conformist refresher to an audience who can get caught up in collared shirts and court reservations. It is almost a royal (pun intended) thumbing of the nose at the sport itself, a smell-the-coffee gesture by the barista himself. Of course, tantrums, lackluster performances and underwhelming results are part of any “revolt,” if you want to call it that, whether the revolt is unwitting or not. Whilst addressing a meta question about the sport itself, Kyrgios sometimes neglects the more myopic mindset required for honing a craft, the repetitious discipline that muscle-memorizes certain skills so that your larger systemic concern can in turn also be refined. But this may be conjecture. I may be, ironically, crediting an uncouth athlete with too much wherewithal. The main question for surface-level debate is whether or not the 22 year old talent will ever have the impetus to spread his physical abilities brainward, whether he will become discontent with hardening into the talent that never really was. Will Kyrgios become a more perfect permutation of himself, or will he remain a paragon of theater? One of those changes takes Herculean effort, the other is something we all sometimes do.